Tommy Edman’s hot bat lifted Memphis to victory in Game 1 of the Pacific Coast League Championship Series. Peoria was idle before hosting the first two games of the Midwest League Championship starting Wednesday night. Results from the game played Tuesday, September 11th. 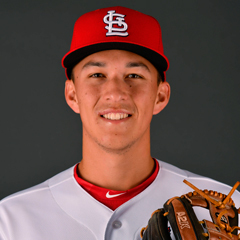 Tommy Edman’s four-hit performance led the Redbirds to a 10-4 road victory over the Grizzlies in the opener of the best-of-five Pacific Coast League Championship. Player of the Day Edman finished a triple shy of the cycle, going 4-for-5 with a double, home run, two runs scored and three RBI. The second baseman opened the game with a blast over the right field wall, giving the visitors a lead they never relinquished. Shortstop Wilfredo Tovar singled three times in four at bats while batting ninth, crossed home once and drove in two as the only other Redbird with more than one of the team’s 12 hits. Eight of nine starters either got a hit or scored at least one run, the sole exception being centerfielder Lane Thomas, who was credited with an outfield assist at third. Kevin Herget (W, 1-0) blanked Fresno through the initial four frames before yielding two tallies each in his last two innings of work. Three of the four hits allowed by the right hander in 5 2/3 were RBI doubles, to go with three free passes issued. Herget struck out six. Herget’s final runner scored under Tommy Layne’s watch. Layne yielded four hits and a walk over 2 1/3. Seth Elledge used two strikeouts to work around a hit and base-on-balls for a clean ninth. The Chiefs’ quest for a second Midwest League Championship, and first since 2002, gets underway on Wednesday at Dozer Park where they will host Eastern Division champions Bowling Green (TB) in the best-of-five series. Game 2 will take place at Peoria on Thursday before the series moves to Bowling Green for the last three contests as needed.